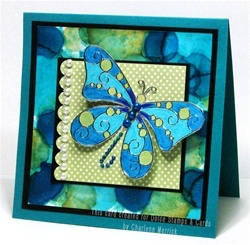 This butterfly is actually a silver sticker by Elizabeth Craft Designs. They are so fun and easy to use! You peel the sticker away from the sticker sheet and place it onto your piece of cardstock. I colored my butterfly with Copic markers (B04, B06, B28, YG11, Y21), but you can also lay the stickers onto colored cardstock or designer paper. 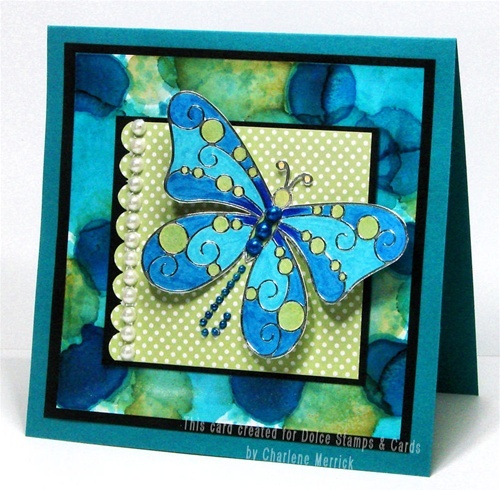 I love creating my own designer paper and playing with various inks. For the spotted background paper here, I used Adirondack Alcohol Inks in Pool, Stream, and Willow on my blending tool and stamped that all over glossy white cardstock. I then added drops of the same ink colors over that to create the larger circles. I used a touch of alcohol blending solution, as well. Once this dried, I spritzed some champagne shimmer mist of the cardstock. The medium-sized pearls on my scalloped border are the natural color they came in. I used the same pearls for the center of the butterfly's body, but I colored them with my Peacock Blue Copic marker (B06).